Drop me a note aringsburg@gmail.com if you have liked the blog. Friday, September 20, 2013. 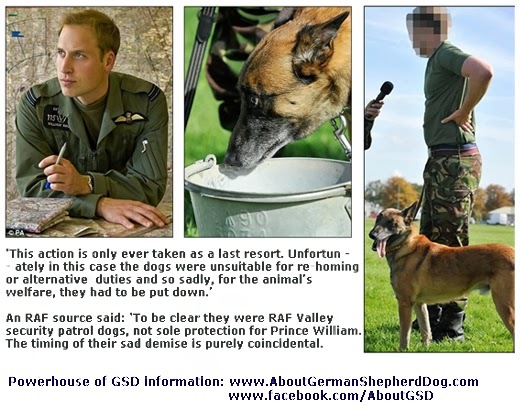 After his shift the two guard dog that had been appointed for the prince's protection were killed for sarcastic reasons - "too old to be deployed again" and "unsuitable to be rehomed". Sometimes this indicates that you are not good at diet management for your dog. This gives an indication that your German Shepherd is being over fed. He/She is trying hide the extra amount of food for the future use. It is hence important for you to understand the right quantity of food for your dog. Some dogs eat up everything even though they are given extra, while a few refuses to eat, and some of them are smart enough to hide their favorite part of the extra food so that then can have them later. However, there may be other reasons to this behavior as well. Some dogs tend to eat at their own choice of time. Many dogs have been noticed to hide their food to be eaten whenever they would prefer, and not on the schedule you want to set for their meal. Diet management for your dog doesn’t just involve planning the food components, but also includes planning the feeding time and food quantity. Failing to set time/ schedule for feeding your dog and managing quantity will eventually create lot of mess, and end up with health issues. 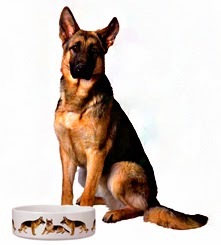 Over feeding your German Shepherds, as for any other breed, may turn out to be quiet detrimental. Most overfed dogs tend to develop irreversible anatomic problem. Digestive and hepatic problem are also quite common in dogs that are overfed. Quantity management for your dog’s diet should be based on the science of giving your dog correct amount of food that provides right kind of nutrition. Whether you give your GSD raw whole foods or you want to keep him on homemade diet, it is important that your dog should finish it within 15 – 20 minutes of serving it. Take off the amount left and do not force your dog to eat or allow him to take her favorite meat piece to hide it for future use. However, gulpers will finish off even the extra food within a few minutes of serving it. It is important to understand how much should your dog be fed at her age. Set your dog’s biological clock according to your will without jeopardizing her health. The moment you bring your German Shepherd puppy home, it is important that you set the meal times, play times, and repose times. These are all part of basic training. It is easy to teach your dog when to expect her meal. Fixing a specific time for her diet will help teach your dog not to hide part of his food to be eaten on his own schedule. She should know her time for meal. All you need to do is to be consistent about your dog’s feeding time. If you offer food to your puppy at a fixed time, her biological clock will be set on that particular time for the meal. This is how you can manipulate your dog’s hunger – you already knew this. Vitamin B12 - How Important Is It For Your Dog? What Should You Feed Your German Shepherd Puppy? Content of this site is Copyright Protected Content in this site are my own researched work and original until specified otherwise. Please do not copy content from this site. This is protected by Copyscape and is under the ownership of Aringsburg. German Shepherd Dog Show – What Does a Judge Look For in a perfect GSD? All you need to know about German Shepherd Dogs. Read out what I have to share with you regarding the amazing German Shepherd Dog breed. Are Alsatian dogs and German Shepherd Dogs same? Who was Max Von Stephanitz and What is SV? Also learn a bit more in depth on German Shepherd Dog training tips, German Shepherd puppy care tips, German Shepherd Dog behavior, German Shepherd instinct, German Shepherd Dog standard and history of German Shepherds.